Last week, Zoya let me into her calculus class to do a data-rich activity of my choosing. Ideally it would involve calculus, appropriate for these kids who had already taken the AB exam. Most of my activities that use elementary functions to model data we get from the world (The Model Shop) or measure ourselves (EGADs) don’t involve calculus, although I think they suit a wide range of students. For some weeks I thought about freeways, and the optimization problem of figuring out at what speed freeways have the greatest flow of traffic. It’s yummy because of the optimization, of course (and that gives us calculus, or at least smells that way) and also because you have to wrap your mind around what you mean by flow. I also found public data from CalTrans—but that’s all a story for another time. 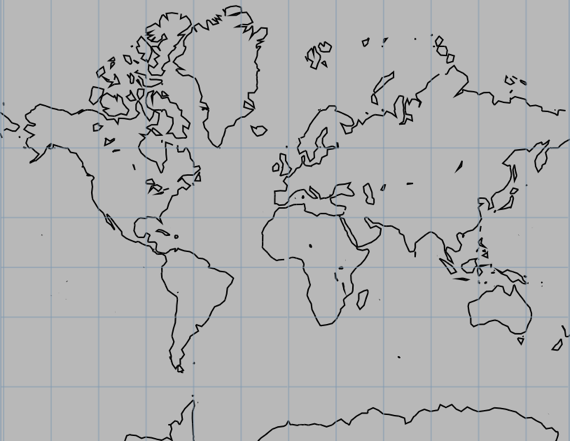 Wisely, I think, I backed off that idea and instead went with a problem I faced long ago when I tried to write a program to draw a Mercator-projection map of the world. Namely: what’s the function in the y-direction that relates distance on the map to latitude? Do Chord Star to get students in the right frame of mind. 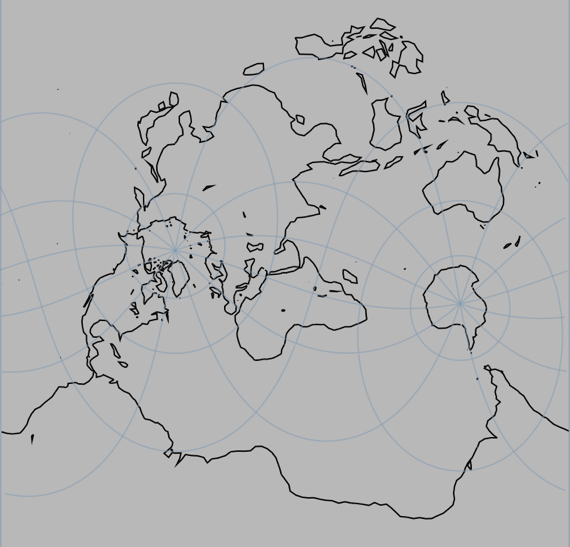 Show a Mercator map with lines but without any degree labels and do a little map literacy, e.g., which direction is latitude; which line is the equator. Present the problem. This asks for the function, but also has the practical version, suppose you knew the latitude and longitude of something and wanted to place it on the map precisely; where would you put it? Let students measure on the handout-map, enter the data into desmos, and try to find a function that fit. Be dissatisfied with the function. Hold a discussion that relates the (approximate) shapes of 1-degree squares to latitude. Realize that this leads (gasp) to an integral. Verify that the resultant function fits the data we couldn’t nail above. Apply the function to something new. And we got it all but the last one. I was ready, but of course we ran out of time. Astute readers will not need to know the details of the lesson, but may not have thought about the Mercator projection and how it results in such a cool calculus problem. So I’ll give “the answer” here (uncharacteristically). Since I’m also writing this so I can remember how the problem works, I’ll do it quickly, assuming the reader knows a bunch of calculus. Not Mercator. Each degree is the same size everywhere on the map. A Mercator projection is characterized by having directions on the map match the directions on your compass. This was useful for sailors in the late 1500s when Mercator invented this. This implies that objects on the map are (locally) similar to objects in the world. Furthermore, it means that at every point on the map, the east-west scale is the same as the north-south scale. I realized this really late in the process but it’s very useful for thinking about the problem. The corollary is that in all the other maps, the scales are not the same, which is kind of frightening and unexpected. So suppose is latitude and is longitude. (There are articles on Wikipedia that do this differently. But I’m an astronomer thinking about altitude and azimuth, and those are the letters I used in school.) Then the functions we want are and . They give us the x and y coordinates for any latitude and longitude. It took me a lot of mulling things over and thinking of it differently before I realized that a map scale is really the derivative of the function we’re looking for. So this is the quick route to the solution, but it’s sure not how I thought of it at first! Anyhow, if we can find that scale, we integrate it (ooooh!) to get the function we want. Want to see the data? What to know what happened in the classroom? Eager to hear my philosophical conclusions? Stay tuned—and hope I have the gumption to write it up! Suppose the south pole were in South America. What would a Mercator map of the world look like?